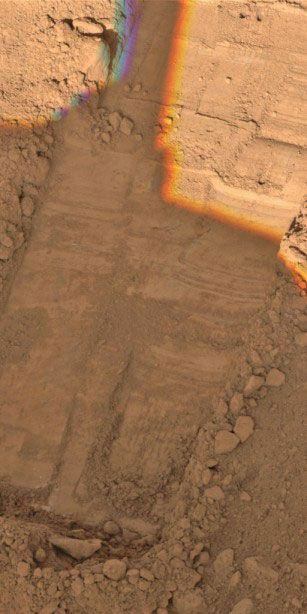 This image, taken by NASA's Phoenix Mars Lander's Surface Stereo Imager on Sol 50, or the 50th day of the mission, July 15, 2008, shows two holes at the top created by the lander's Robotic Arm's motorized rasp tool. The holes are about 1 centimeter (0.4 inch) apart. NASAscientists planned to instruct the Phoenix Mars Lander to test out its methodfor shaving and collecting ice for a second time Friday. The test isin preparation for collecting a similar sample of ice to be analyzed in one of Phoenix'sinstruments in the coming days. The icescrapings will be placed into one of the tiny ovens in the lander's Thermal andEvolved-Gas Analyzer (TEGA), which heats up samples of Martian dirt andanalyzes the vapors they give off. Mission team members hope that the TEGAanalysis of the ice samples will show that they are rich in water ice, as somescientists expect. Water isthe key to life as we know it, and the lander, which touched down May 25, isdesigned to probe its location in the Martian arctic for conditions that mightbe hospitable to microbes. The 90-day mission is not designed to detect life. The firsttest of the collecting method was conducted on July 15. The rasp on the endof the lander's scoop was used to scrape away some ice into the scoop. The testplanned for Friday will be a little different. "First,we will scrape the terrain before rasping, to expose fresh terrain forsampling," said Richard Volpe of NASA's Jet Propulsion Laboratory, in Pasadena, Calif., an engineer for the Phoenix robotic arm team. "Second, we will raspfour times in a row, twice the amount previously. Third, the scoop blade will berun across the rasp holes to pick up as much of the tailings as possible." Thescrapings are being taken from a 2-inch (5-centimeter) deep trench informallyknown as SnowWhite. The samplefor the TEGA instrument will also be taken from this trench. Missioncontrollers hope to collect and deliver the sample quickly and early in theMartian morning to minimize the amount of ice lost to sublimation.